I’m finding it increasingly difficult to discover a relationship between the Mass as I experience it these days and the community celebration of Eucharist for which I long. Clearly there is a link between the present form of our celebration of Mass in Ireland and the massive leakage of the middle aged and younger generations from Parish Church attendance. Younger generations are not finding inspiration in the present form of celebration, nor are they experiencing a call to the priestly vocation – hence the shortage of priests. At the Mass as celebrated in Ireland today, in an average Dublin Parish Church, one occupies a place in a pew behind mostly elderly people. The arrangement of the congregation members in a series of pews, out of view of each other, does nothing to foster a sense of community celebrating together – let alone of communal sharing on the place and power of the word of God in our daily lives. We, for the most part, have come here to get/hear Mass celebrated on our behalf by a priest, to hear him read the prayers and scripture texts and to hear his point of view on what concerns our lives and our relationship with God. There is little sense of communing, of community. We do not share actively through communing together on the word of God – nor for the most part do we share in the sacramental ‘breaking of bread’, the bread that is broken during the Mass. Both are exclusive to the priest up at the altar. 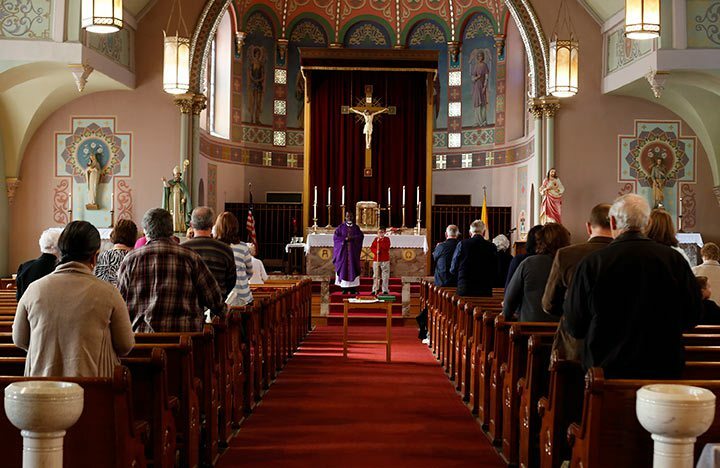 Sunday Mass in many parishes is not celebrated with congregational singing. The congregation remains passive throughout. People queue up in silence to receive communion at the altar rails. Then, after the two money collections to the accompaniment of parish notices, followed by the final prayer and blessing by the priest, the congregation members summarily leave for home to get on with the exigencies of life. sending us as community to ‘go out to the whole world to proclaim the good news’. In keeping with the readings during Sunday Mass in Rathmines Parish some years ago, this challenge was powerfully put to us by a young member of the choir in the Communion Reflection she read to us, which included: ‘We appear to have no problem standing by and barely protesting at the massacres carried out in Syria on a grand scale every day. Isn’t it time we ourselves took a stand by joining organisations such as Pax Christi…… based in our own parish in the hope that each of us can make a difference……’…. Both the reflection and the hymns suggest a form of getting in touch with our own reality, our failure at times to bridge the gap between what we profess and how we live. Mere choral recitation of ‘I have sinned most grievously in thought, word and deed’ sounds a bit empty by comparison. Altogether there was an element of community engagement in that celebration, inviting and issuing in further engagement. ‘Ite missa est’, ‘you are sent’ to the whole world to ‘proclaim the good news’. 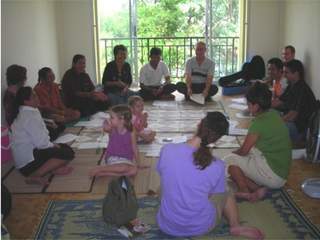 Clearly there is a shift, however slight, towards an emphasis on celebration of Eucharist as table fellowship with each other and with the living Christ among us through ‘the breaking of bread’, ‘take and eat for this is my body’ and ‘Ite missa est’, go out you are sent’ to the whole world to proclaim the good news? One is reminded of the spectacle of so many young people variously exercising ministry including ministering to the homeless in the street; called and then sent, ‘Ite, missa est’. The urgent need is to take steps towards securing the celebration of Eucharist lest we be deprived in the near future in face of the crisis of scarcity of priests. To ensure that we may develop as Eucharistic communities in Ireland calls for a much more radical approach than reinstating married priests, dispensing with compulsory celibacy and allowing women to become deacons. Should ‘communion’ look more like this? Surely the time has come for us to seek a more realistic solution by taking an honest look at how we celebrate Eucharist. It would involve going back to the tradition originating in the life of Jesus in which celebrating through table fellowship played such a major part – throughout his life, and up to the time of his ascension, as it did in the early Palestinian communities and as revived in some parts of the world today, notably Central and South America and parts of the far East. I loved the version of ‘Ite Missa Est’. Powerful words. I also agree that pews do not facilitate community but actual hinder it by creating barriers. The symbolism (so important to the concept of sacrament) isn’t helped either. We should be using the (extra) space we have these days with more creativity. But again, resistance to change will probably ensure we remained tethered in our stalls. You say Teresa, that the future development of Eucharistic communities in Ireland calls for “a much more radical approach than reinstating married priests, dispensing with compulsory celibacy and allowing women to become deacons“. I’m inclined to agree but how we exercise ministry is just not acceptable and we need to say so very clearly. Most importantly, whatever else we do, we need to include and not bypass these very necessary reforms in how we do ministry, if the church is to have any credibility going forward. You might well agree its not an either/or situation. Doesn’t this suggest both the ideal circular layout of seating in Christian ‘communion’, and the ‘familiarity’ that needs to be encouraged – as opposed to the always stiff and unequal society we tend to build? Thank you Teresa and Sean. The most communal Eucharist I am privileged to participate in occasionally is where we sit in a circle on cushions on the floor. The lectionary is passed around for the readings and people respond as they are touched. For Communion the broken bread and wine is is shared around the circle. Some years ago in my parish we had a curate who created a large table in front of the altar using two sheets of 8ft x 4ft hardboard and before the Consecration the congregation were invited to come up and stand around it, creating table fellowship. So it can be done, if there is a will there’s a way. In my posts here and on the ACP site I have proposed that all those who cannot receive the Sacrament of Absolution for whatever reason apart from the sin against the Holy Spirit should be permitted to receive the sacrament of Holy Communion in fellowship with all baptised Christians. As I believe the Church has been given the means to permit them to do so through the true Divine Mercy Image an image of broken man. But to date I have not shown how this can be reconciled with present Church teaching on the Sacrament of Absolution so I will now try to do so. Many who go to confession do so knowing that they are going to commit the same sin again as they are engulfed in habitual sin, the alcoholic, compulsive gambler, substance-related addicted and those with sexual addictions etc. Before receiving absolution they resolve not to sin again with varying degrees of intent to do so, it is fair to say that many will know that they are going to recommit the same sin again. They will know this because they have tried so many times before, to break their particular sinful habit and failed. Just prior to receiving absolution the sinner says (or words to the effect of) “I resolve not to sin again” while asking for forgiveness at that specific moment in time. On absolution grace is given that assists spiritual growth helping to overcoming future sin. The sincerity of the confession made and resolve of the sinner not to sin again to some degree will determine the likelihood of a successful transformation of their behavior. I say to “some degree” because spiritual discernment of oneself can be difficult, as seen (Known) sin can be a manifestation of underlying emotional problems. Time is meaningless to God, progress will be made by some but the reality of each individual is only known by God only He can know the true state of person’s disposition. God is patient with all of us His Mercy is greater than any sin, we may walk in darkness but if we are sincere in wanting to brake with a sinful situation (entanglement with sin) I believe progress will be made gradually through transforming grace (Actual grace) leading us to Sanctifying Grace. The sinner when making an act of public confession before the true Divine Mercy image just prior to receiving Holy Communion with the pray given by our Lord Himself to the Church “Jesus I trust in thee” when said from the heart in trust will form the basis for an Act of Perfect Contrition; friendship with God based on trust (Faith) as it “unites us to God”. If the true intent through humility (St Bernard-Humility a virtue by which a man knowing himself as he truly is abases himself) is to form friendship with God through trust in His Divine Mercy even though the sinner knows his/hers own circumstances (Entanglement with evil) will lead them into sinning again will God forgive them in that particular moment of time? There can be only one answer to this question. This forgiveness in the present moment can be seen in the Church’s teaching on “An act of Perfect Contrition” as an act of Perfect Contrition removes the guilt and eternal punishment due to mortal sin even before the sinner has received absolution in the sacrament of penance. The Church adds a proviso: provided that the person has a firm resolution to have recourse to sacramental confession as soon as possible. This proviso is important but it must be acknowledge time is meaningless to God if the will of the recipient of Holy Communion is driving them to the full Sacrament of Reconciliation will grace be given to assist spiritual growth as their intent to change direction (Repent) is sincere in true humility before God? Can the Church wait patiently to administer the full Sacrament of Reconciliation God is patient with all of us His Mercy is greater than any sin. When the recipient approaches the priest for communion after his /her public confession the priest could say (or words to the effect of) “Welcome to the path/way of salvation (Confession) receive The body of Christ” acknowledging the commencement to receiving the full sacrament of Reconciliation by doing so the outward sign of inward grace His Divine Mercy is manifest in the present moment, absolution is not given by the Church they dwell in His Divine Mercy as he/she returns to his/her sinful situation (Entanglement with evil) but a journey of HOPE has commenced. This must be clearly understood by the laity in regards to the indissolubility of marriage that absolution has not been given. The Church cannot sanction sin but it can sanction mercy only when a true commitment to practice continence is the Sacrament of Reconciliation to be instigated. The denial of Holy Communion is not the passing judgment on the person’s subjective guilt, but rather it is reacting to the person’s public unworthiness to receive Holy Communion due to an objective situation of sin” I am saying that this objective situation of sin in a public confession is overcome. How do you change the present Church model that only works upwards, into a culture of discipleship based on equality? To bring about change can be difficult as direct confrontation will not change any bias found within human hearts. The barge of Peter holds many type of fish some eventually to be discarded, as wolfs can be dressed in sheep’s clothing. No matter what one may think of the present state of the Priesthood they the Shepherds have the responsibility to lead the sheep to the sheepfold, changing structures or creating new ones does not take us to the heart of the problem which is one of dishonesty, this dishonesty filters down from the top of the pyramid to the base, the laity has contributed to the building and maintenance of this pyramidal structure some through diffidence due to having been taught to behave like sheep, others by acting out external gestures of religiosity in conveying an image respectability. To bring about change we need to look at ourselves honestly, this can be painful but if we do so it will create spiritual growth, leading us all to the true base of the pyramid a place of humility. Those who reside there will not seek worldly power or position within the Church as they will be driven by love of God and neighbour, at the heart of this love is the serving of the Truth and its base is the Inviolate of God given within the gospels. This serving of the Truth will draw down any arrogance remain at the top of the pyramid. If we do not do this, new structures that are been proposed that incorporate married priest female priest etc will not stem the flow of people leaving the Church or attract new converts as it will continue especially in West to dissipate. How does Peter guide the barque through the present storm of turbulence with one wind blowing one sail to the right and another wind blowing another sail to the left without tearing her apart, while at the same time trying to keep true to her moral compass ensuring the safe arrival of All her children, including those who are now stood outside of barque on dry land? Many need encouragement to return to the fold as they silently cry out for Hope in their brokenness (entanglement with evil), the cynicism of many including the young has to be confronted and this can only be done if the Church demonstrates integrity to all peoples. The Holy Spirit is the Wind that blows on the true sail of Peters Barque guiding it towards its true destination and that sail is called humility. I have written much on the true Divine Mercy image an image of broken man given by our Lord to His Church it is an image that will induce humility on all those who venerate (Look upon) it with honesty and it is waiting to be inserted as an emblem into the true sail of Peters Barque for the Holy Spirit to blow upon. If this were to happen a new dawn would break for the Church, from this base, one of serving the Truth in humility, new leaders (Teachers) male and female would emerge to take their rightful place within the church. 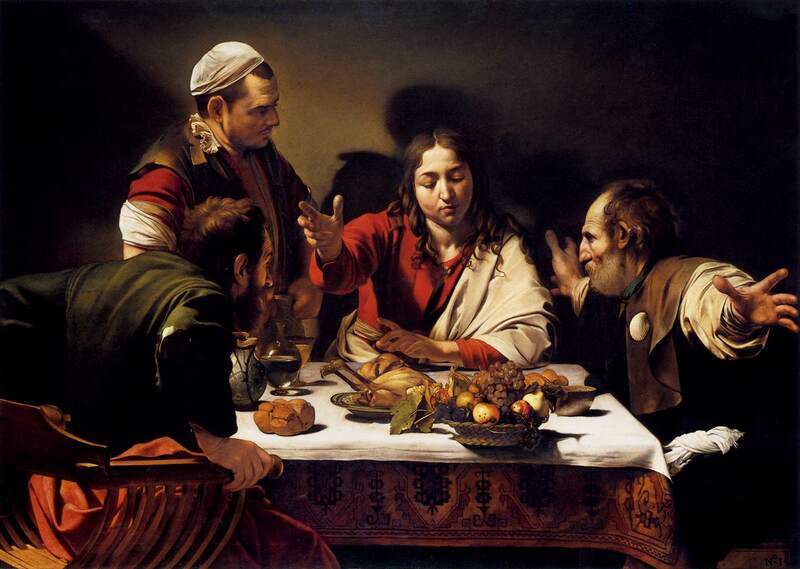 Then Table Fellowship may possible find its place as an extension of the Mass. As it attempts to fulfil these words of Jesus Christ, that call out to All, no matter what their state of being. In my posts above 23/02/2017 at 6:10 pm I have proposed a means in that all those who cannot receive the Sacrament of Absolution for whatever reason apart from the sin against the Holy Spirit should be permitted to receive the sacrament of Holy Communion in fellowship with all baptised Catholics. To give clarity to my post above I have looked for a comparable situation to demonstrate the concept of an Act of Perfect Contrition made publicly before the true Divine Mercy Image, just prior to the communicant receiving Holy Communion. He knows he cannot return as he cannot receive the Sacrament of Reconciliation or partake of the Bread of Life, he is entangled in a sinful situation, in his heart he knows that he cannot leave his present family and he also knows that continence even if attempted is unrealistic for him and his new partner, if he is to maintain family harmony at this moment in time. I believe that the parable of the Pharisee and the tax collector in the temple exemplifies the situation that John is in, in relation to the tax collector as both are entangled in serious sin. But was full of himself and his own goodness; the favour and grace of God he did not think worth asking his pray was not accepted. The Publican is aware of his own sin, it is fair to say he now endeavours not to misuse his power as a tax collector but nevertheless goes back (Home) to his position of colluding with the enemy, he is still entangled in a sinful situation. Colluding in the sense of working (Taking income) from the oppressors of his people and remaining in an ongoing situation of conflict with them, as his position would entail working with spies informers etc. The publican’s pray was full of humility, and of repentance for sin, and desire towards God. I have the same hope for John in his desire for reconciliation towards God in these words said from the heart.